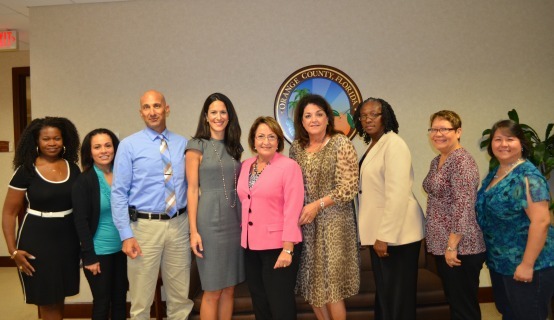 Mayor Teresa Jacobs and members of her administration recently welcomed Orange County’s newest Advisory Board members at an informal meet-and-greet and shared information on how local boards operate within the County. Orange County boasts 55 different Advisory Boards with more than 400 local citizens serving as volunteers. The Orange County Board of County Commissioners appoints eligible local citizens to advisory boards, which are an essential part of the governmental process in Orange County and Central Florida. Orange County citizen Bonnie Morales, who moved to the Lake Nona area last year from New York City, said her interest in homelessness issues and sustainable housing prompted her to apply for a volunteer position with Orange County’s Affordable Housing Advisory Board. Orlando attorney Meredith Sasso said learning about and becoming more engaged in local government is the key to making a community your home. Citizens are encouraged to take an active role in their community. A current list of Advisory Board vacancies is available on Orange County’s website. A collection of photos from the informal Advisory Board Orientation Meeting are available on Flickr for use by the media.